Samsung Display would not be bothered if you pound away at this panel, and go ahead, drop it till the cows come home, because they are rather confident about their new claim. They have come up with an unbreakable panel for a phone, a tablet, or for that matter a console for—you name it—cars, military mobile devices, portable game consoles. Datelined Seoul, the announcement was issued by Samsung Display on Thursday. How unbreakable? Paul Lilly, HotHardware, reported that the Underwriters Laboratories went ahead to certify the screen. That is notable, since the UL is an official testing company for OSHA, the Occupational Safety and Health Administration of the US Department of Labor. No glass casing here, Lilly reported. This is a story of plastic, claimed to be similar to glass, to cover an OLED panel. Why not glass? 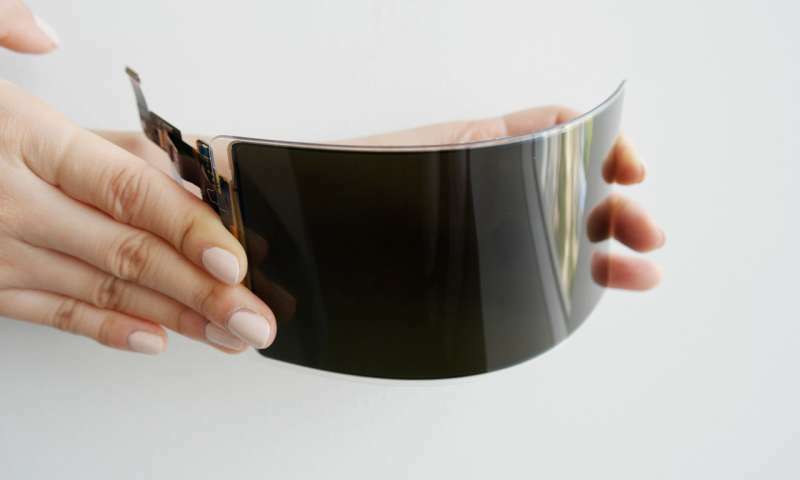 Samsung said, "Current-generation flexible display products attach a glass-covered window to their display that often breaks when severely impacted." "The fortified plastic window is especially suitable for portable electronic devices not only because of its unbreakable characteristics, but also because of its lightweight, transmissivity and hardness, which are all very similar to glass," said Hojung Kim, general manager of the Communication Team, Samsung Display Company, in the news release. Tyler Lee in Ubergizmo: "If there is a weak point on most smartphones, it would be the display as this is generally made from glass." At the end of the day, said Lee, glass is glass— a phone falling at the wrong angle could end up in your display cracking. Samsung Display said it developed the panel "with an unbreakable substrate and an overlay window securely adhered to it." The point is not lost on tech watchers reacting to the announcement that flexible displays are as much the story as unbreakable displays. CNET has its eyes on the first truly foldable handset—which "could be around the corner." Steven Musil wrote that "Samsung is widely expected to release a device that will be a truly foldable phone with one flexible OLED display and no hinge." Here is how the UL testing went down, as reported by Lilly. The display survived 26 successive drop tests from 4 feet above the ground. But UL got even more ambitious in seeing if the display could survive drops. The display was dropped from 6 feet above ground, higher than the US military standard, and it survived. Another trial involved temperatures. Extreme temperature fluctuations from -32C (-25.6F) to 71C (159.8F) did not bring it down, as it continued functioning normally— no damage to front, sides or edges. Predictably, the announcement had tech watching sites guessing at the likelihood of seeing these unbreakable covers in stores any time soon. No official dates were publicized as to when Samsung or its display customers will use the technology. Fingas remarked that "Samsung will offer its panel for use in devices like phones, cars, game consoles, tablets and 'mobile military devices,' but that's contingent on both Samsung itself and partners lining up." The New York Post said, "Some online chatter suggests we'll see this display for the first time in Samsung's coming foldable phone."